San Juan Puerto Rico is a romantic caribbean city located in Puerto Rico. Puerto Rico, a common wealth of the United States is the most popular caribbean island couples around the world choose for destination weddings and honeymoons. San Juan Puerto Rico is comprised of cities with barrios (neighborhoods) that make up various geographical points across the island. Condado Puerto Rico is a barrio in San Juan Puerto Rico and best known as the entertainment, hotel and foodie barrio in San Juan. Condado Puerto Rico is home to the most popular Hotels, Resorts, venues and beaches in san Juan Puerto Rico. It is also a very short drive from the Historic Old San Juan that is home to a castle and Fort build to protect the island by the Spanish in the 1400's. Condado San Juan is the most visited area in San Juan by people around the world and is the center of the Destination Wedding industry in Puerto Rico. Couples have a wide variety of venues to host small to extremely large destination weddings at the Hilton Condado Plaza, Vanderbilt Condado, La Concha and Marriott Stellaris which have beautiful beach front properties, pools, and amazing amenities to make any couples Destination Wedding day perfect. In old San Juan which is a short distance away the Sheraton Old San Juan and EL Convento are beautiful options for couples seeking a more of an old world feel to their Destination Wedding. Couture Bridal Photography, owned by Alfredo Valentine, who's family is from Puerto Rico is a Puerto Rico Destination Wedding Photography specialist with experience and knowledge of Condado and Old San Juan Puerto Rico. Couture Bridal Photography is the most preferred Wedding Photography studio with a base of operations in Condado San Juan for which to meet with clients. Brides and grooms choose Couture Bridal Photography over all the other wedding photographers for our quality, artistry, value and peace of mind since Couture Bridal Photography is based in Fort Lauderdale with satellite offices throughout the United States and Puerto Rico. Couture Bridal Photography is also the most preferred Destination Wedding Photography studio at Hilton Condado Plaza, La COncha, The Vanderbilt, Marriott Stellaris and every other hotel and resort in Puerto Rico, Vieques and Culebra for our Award winning published artistic documentary Wedding photography. Couture Bridal Photography rose to fame in Fort Lauderdale Florida and quickly became a world favorite wedding photography studio for our distinct and artistic style of Wedding Photography. Couples around the word find that the wedding photography style of Couture Bridal Photography Wedding Photographers Alfredo Valentine and Giovanni Gutierrez is Elegant, Romantic and timeless. By using a variety of photography styles such as editorial, illustrative, fashion, glamour, photojournalism and fine art photography, a unique style of wedding photography was born. Couples from the United States, especially New York, New Jersey, Connecticut, Chicago, Texas and California choose Couture Bridal Photography to fly into San Juan Puerto Rico and provide the most comprehensive Destination Wedding Photography experience in Condado. 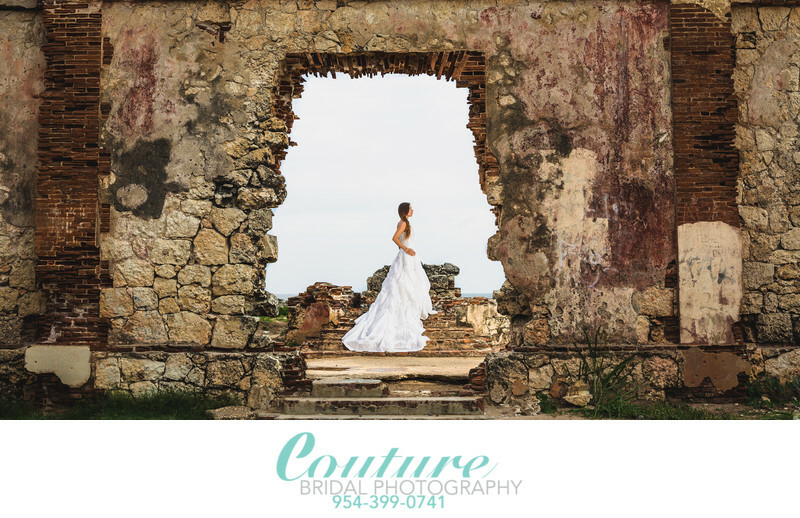 Call Couture Bridal Photography to schedule a Destination Wedding Photography consultation and save for booking a year in advance of a proposed wedding date in San Juan Puerto Rico. Location: 1077 Ashford Avenue, San Juan, 00907, Puerto Rico. Keywords: Bridal Portrait (120), Bride (114), Destination Wedding (27), Isabela (3), Puerto Rico (39), Punta Borinquen Lighthouse (3), Ruins (3), San Juan (33). 1/200; f/5.0; ISO 100; 50.0 mm.